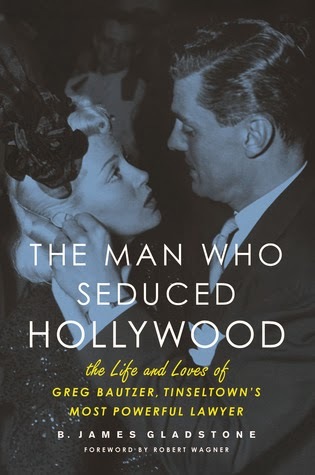 I confess that I've never heard of famed Hollywood lawyer Greg Bautzer. Now thanks to B. James Gladstone's book I'm fully informed about this fascinating man. Bautzer was a quintessential charmer who used his people skills to woo beautiful women and win court cases. His list of romantic conquests is as impressive as his list of clients. Bautzer had relationships with actresses Lana Turner, Ginger Rogers, Joan Crawford, Dorothy Lamour, Merle Oberon, Jane Wyman, Ann Sheridan, Simone Simon and that's only part of the full list. Bautzer's clients included Howard Hughes, Marion Davies, Ingrid Berman, Robert Mitchum, Farah Fawcett, Jeanne Crain, Kirk Douglas and more. One of his clients and friends was actor Robert Wagner who wrote the foreword for this book. Bautzer handled many high-profile Hollywood divorce cases most notably the very complicated one between Ingrid Bergman and her first husband Petter Lindstrom. There was adultery, a pregnancy, child custody issues as well as a morality clause in Bergman's film contract. Bautzer also handled Nancy Sinatra's divorce from Frank Sinatra but still managed to befriend Frank after the fact (that's an accomplishment if there ever was one!). He also handled wills and estates of big tycoons like William Randolph Heart and Howard Hughes as well as financial transactions of major corporations like TWA, CBS, Warner Bros., MGM, Paramount and the Flamingo casino in Las Vegas. He faced notorious gangster Bugsy, got punched by actor George Hamilton and tried to pick a fight Humphrey Bogart. Needless to say, there are countless stories about all the romances, fights, legal battles, friendships and partnerships that Bautzer had in his long life and career. Bautzer wasn’t perfect. He had a short temper, was obsessed with winning and eventually became an alcoholic. He wasn’t very good at monogamy either and didn’t take naturally to fatherhood. However, he was a talented lawyer who wanted loyalty above all else, loved his clients and would do anything for them. He was generous too and even waived legal fees if his clients were in financial straits. The author B. James Gladstone is the Executive Vice President of Business and Legal Affairs for Lionsgate Entertainment. In this book, he’s covering the life of a figure who is both a legend and a hero to him. I couldn’t quite tell if Gladstone had ever interactive with Bautzer during his lifetime but he did have a brief friendship with actress Dana Wynters before her death in 2011. Wynters was Bautzer’s third wife, the mother of his only child Mark Bautzer and proved to be an invaluable resource to Gladstone in writing this book. This book is an endlessly enjoyable read full of interesting stories about a figure who is very captivating. It follows Bautzer’s life story chronologically for the most part but some chapters dip in and out of different time periods. Some chapters focus on big moments, relationships and trial sin Bautzer’s life and career. These chapters profile Bautzer’s relationships with the following key figures: Lana Turner, Bugsy Siegel, Howard Hughes, Ingrid Bergman, Humphrey Bogart, Dorothy Lamour, Marion Davies/William Randolph Hearst, Robert Evans (Paramount), Kirk Kerkorian (MGM), Dana Wynters, etc. Bautzer was a key figure in many deals, transactions, divorces and meetings. Because of him certain movies were made and certain careers rose and flourished. While not essential to one’s film history education, I think it’s very interesting to read about the other people who worked Hollywood during it’s golden era. It wasn’t just actors, actresses, directors and producers. Many people in the industry and on the peripheral influenced film history in many ways. I loved the story of how Bautzer borrowed $5,000 to start his career. He used that money to dress nicely, get the best tables and the best restaurants so he could pique the interest of the Hollywood elite and open doors to both meet them and work with them. I did find one error in the book. The author recounts a story that Bautzer himself told many times of Marion Davies requesting a black Rolls Royce so she can take it to the 1953 New York wedding of JFK and Jacqueline Bouvier. The wedding was actually in Newport, Rhode Island. I thought maybe it was just a location error until the story also said that Davies had the car waiting for her at Grand Central Station. It's very possible that the story was actually about Peter Lawford and Patricia Kennedy's New York wedding in 1954. I did a little digging and found out that Davies was a guest at that wedding. Davies might have also gone to the JFK-Bouvier wedding too. I've been told that the author is looking into it and it will be clarified when the paperback is released. Thank you to Meaghan of IPG for sending me a copy of this book to review! Sounds like this could make for a pretty good movie itself, depending on where the focus would lie. GREAT write-up, Raquel. This sounds fascinating! I'm avoiding your Room 1219 post until I can get to the book! Until I saw there was a book out about him, I had no idea he was so influential! Thanks for this review. Bautzer has been on my radar for a while now and I've always thought that he deserved his own biography. And when someone got around to doing it, I hoped that it was done well. From your review, it seems it has. (Oh, and well done catching that one error, you little Sherlock, you. IMPRESSIVE!